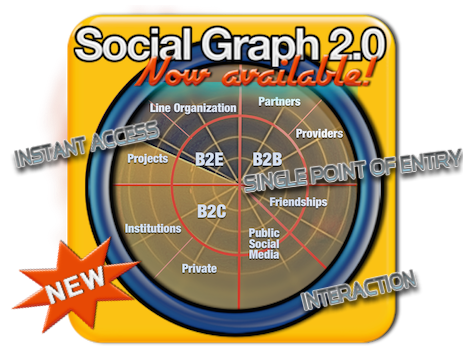 Discover and benefit from your Social Business Network with Social Graph 2.0! 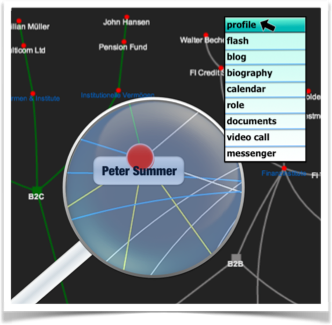 Enterprise Know How AG developed an inimitable one-of-a-kind feature: Your entire Social Business Network is visualized and provides immediate interaction. People who think and act with you in all possible dimensions as well as your direct friendships and their external Social Media Network coordinates like Twitter, LinkedIn or Google+ are ready to be connected. The most important features of Who is Who 2.0 and Yes we Know 2.0 at your mouseclick: your Single Point of Entry! Gain a general picture, discover and benefit of relationships – everything in quick access and in intuitive mode. Navigate directly to desired persons, organizations, communities. Click to favorite page or select the appropriate function from context menu. Benefit from various opportunities of this – and all other features of our B2x products Who is Who 2.0, Yes we Know 2.0 and All is One 2.0. Yes, it runs in your preferred J2EE application server environment e.g. IBM, Oracle, Apache.